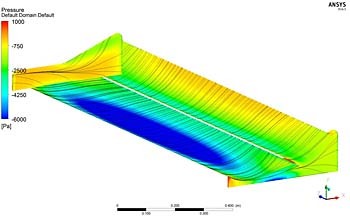 The use of Ansys CFD software has enabled mapping of our wing designs in a 'virtual wind tunnel' environment to enable comparisons of the relative levels of downforce and drag within our range of wings. We have also validated the performance of many of our wing combinations in the MIRA full-scale wind tunnel. 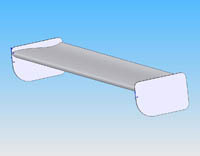 The computational analysis has been carried out on 3D CAD models of the wings typically at 1700mm span on rear wings and 1500mm span on front wings. The wings were tested in isolation so the data here should not be regarded as what might be obtained on a car, especially with rear wings, which have the rest of the car ahead of them to compromise the airflow! The data is purely for comparisons between our different wing configurations. Detailed mapping has so far been carried out on our single-element rear and dual-element rear wings and on single-element and dual-element front wing combinations. 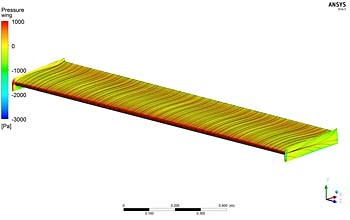 It's important to note that different CFD 'codes' and different CFD parameters will generate different results, even on the same wing, so beware of comparing our CFD data with wing data from elsewhere, and vice versa. Such data, ours included, should only be used for comparisons where the same CFD software and settings were used. However, we have been able to map some of our competitors' profiles, and as such we know that our designs offer highly competitive levels of performance, whether you are seeking maximum downforce or maximmum efficiency. Our rear wing data plots show the range of performance covered by the profiles mentioned here, all at 1700mm spans. To obtain approximations of drag and downforce at other spans, simply multiply the forces tabulated and plotted here by the ratio of the span you are interested e.g. for 1000mm span data, multiply by 1000/1700. For different speeds, multiply downforce by the ratio of the speeds squared, e,g for 75mph, multiply by (75/100)^2 or (75/100) x (75/100). NB power absorption is proportional to the cube of the speed so in this case, at e.g. 75mph, multiply by (75/100)^3. 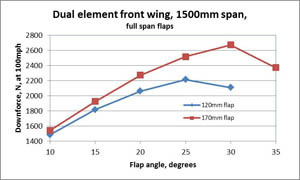 Our front wing data plots show the comparisons between our single-element and dual-element front wings, based on our SM153 main element profile, at 1500mm span. 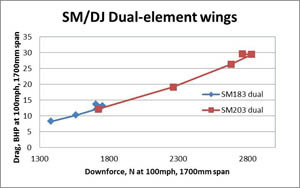 Once again approximate values for downforce at different spans and speeds can be worked out as described above. Please contact Simon McBeath if you cannot find or calculate the data you need here. The 'SM/DJ 183' (183 stands for 18% maximum thickness at 0.3 x the chord distance back from the leading edge) is our original rear wing main element design, and it has found applications on lower power single seaters, and also on GT and saloon/sedan racecars. Maximum chord is 300mm, and the wing can be obtained from DJ Engineering in spans up to 2100mm. 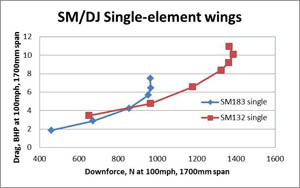 The 'SM/DJ 132' is a thinner, more cambered profile (13% thickness at 20% chord) originally intended as a high downforce, high efficiency single element device. Ideally suited, for example, to sports racing, GT and saloon/sedan applications where technical regulations mandate a single element wing with a maximum chord of 300mm/12in. It also makes a very effective dual-element wing. Chord is again 300mm and maximum span is 2100mm. The 'SM/DJ 203' is a heavily cambered, slightly thicker (20% thickness at 30% chord) mainplane intended for dual- and multi-element applications. It too comes at 300mm chord and in spans up to 2100mm. The 183 dual element wing has been successfully used on Supersports, Time Attack, Britcar and Britsports cars, and on various hillclimb and circuit sports racing, GT and saloon/sedan cars too. 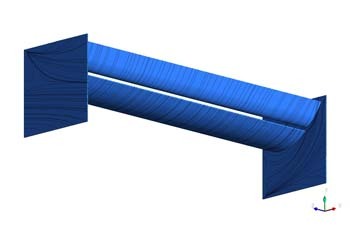 The new in 2015 SM132 wing has been finding dual-element applications on sports prototypes where chord or number of elements is not restricted. It also makes a good choice for high downforce Time Attack, SCCA Autocross and hillclimb applications. The 203 dual element wing has found applications in the top classes of Time Attack around the world where equally high balancing front downforce packages are possible, in various SCCA Solo II / Autocross classes and also on single seaters in UK hillclimbing. 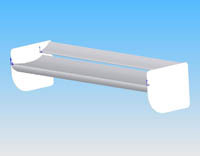 Spans up to 2100mm are available. Our 153 front wing main element has been designed with ground effect in mind, and it is the basis for single, dual and multi-element variants. As a single element wing the chord is 275mm and spans up to 1700mm are available. With the addition of flaps, available in 120mm, 150mm and 170mm chords and in a wide range of span options, the 153 front wing can be built up to offer a wide range of downforce levels. 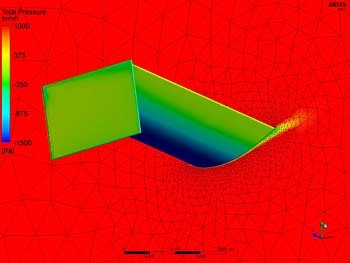 Narrow span flaps generate less downforce than wide span flaps, but,among other parameters, the shape and dimensions of a racecar's nose may well dictate the practical configuration that can be used. Racecars with high noses can sometimes accomodate full span wings and flaps. Please call us to discuss your needs.